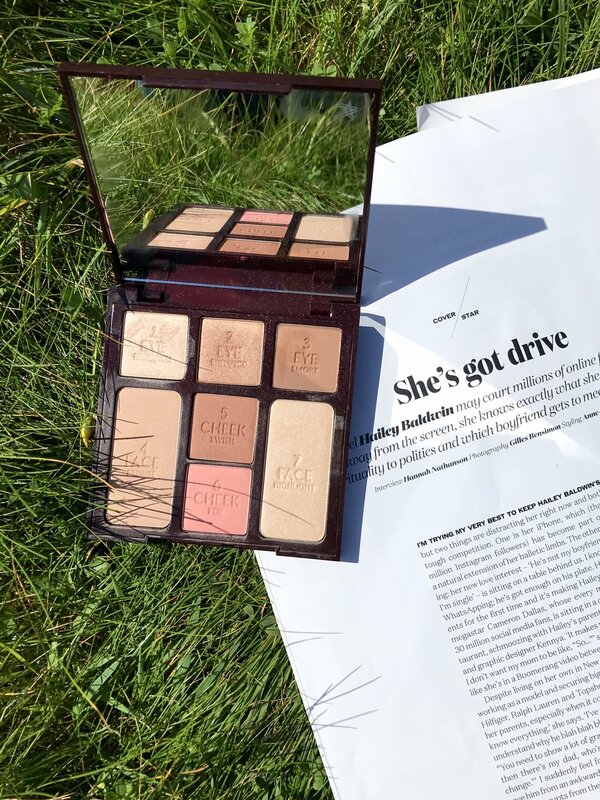 Charlotte Tilbury's Instant Look in a Palette is a limited edition entry to an already impressive range of products. (We all know that, and if you haven't tried anything from the brand you should. I've been reapplying Pillow Talk non stop for the last couple of months and I'm making another purchase as I type). Having previously tried a few items, I find myself constantly checking out the latest and making copious wish lists pretending I will have the budget eventually. However, it was my birthday last month so I needed to treat myself to something special. Instant Look in a Palette. Three colour options available. I picked Glow Beauty. (Because I'm all about that glow, always.) I would have chosen Natural Beauty if I did a proper research, but no. Got a little too impulsive and thought about the mistake later. More on that ... later. In most cases, I wouldn't consider getting a palette. I've never owned an eye shadow one except for a solitary duo from Nars that I got last year that I still like to use now and then. Oh and a trio (contour/highlight/blush) from Sleek that I thought was chalky and flat looking on the skin. But this? This one has got base products in it (and more), and base makeup after skincare is my jam. Back to the palette. It contains: Eye shadows-  Brighten in shimmery ivory for all over the lid,  Enhance in shimmery rose gold for the crease and  Smoke in matte brown to smudge across the lash lines. Bronzer from the Filmstar Bronze & Glow formula (Light to Medium shade)  Face Bronze,  Cheek Swish in burnt orange,  Cheek Pop in pink with a limited amount of shimmer and  Face Highlight. Essentially, it is meant to help you achieve a healthy glowy look that is flattering on everyone within a short period. The textures without a doubt. They're my number one pet peeve about expensive makeup. I'm expecting it to deliver. I might not like the shades or they might look good in a pan but I'll definitely not tolerate cheap consistencies and qualities. All of these, especially the cheek options and highlighter are top-notch in that category- easy to work with, blendable, silky. The highlight, even though it's in a powder form, has almost got a candle light creamy look and feel to it when applied. Dreamy. Ideally, I would have liked for the shadows to have less shimmer, the brighten one in particular. Hence, I'm a bit frustrated with myself for not going for the Natural Look. I think yes. Realistically with palettes they are always shades that are used less or not at all. This is not the case here. Every single one delivers. It's worth it because it's more than just make up. It's the packaging, the tissue unwrapping, the joy of applying it not only for special occasions and finally it's the brand itself. Charlotte promotes products that are easy to use, shares lots of tips and tutorials helping us look and feel fabulous with a minimum effort every day.